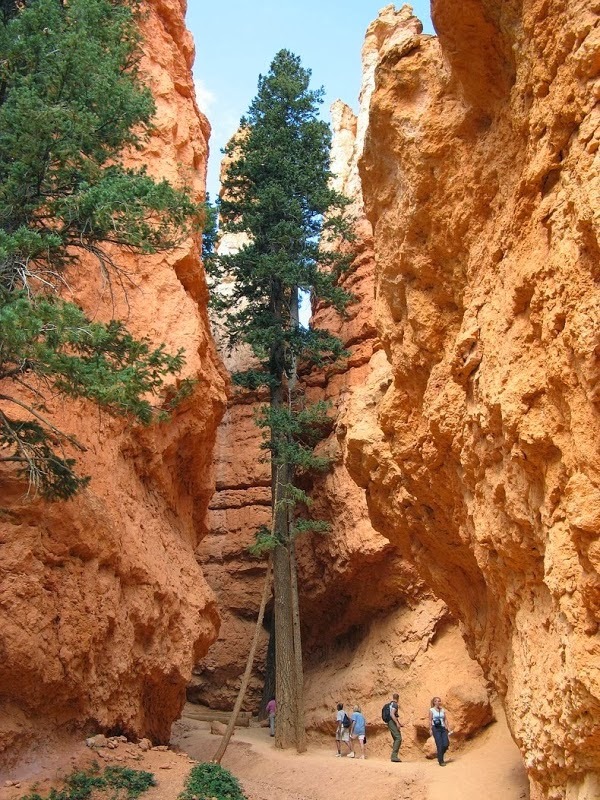 Inside the Bryce Canyon National Park, in the narrow alleys formed by towering rocks on either side, grow one of the tallest trees of the Southwest - the Pinus ponderosa. Some of these trees measure more than 5 feet in diameter and grow to incredible heights of 150 feet, as they try to poke their way out above the surrounding cliffs. Named for its ponderous (heavy) wood, this pine is the major lumber tree in the Southwest. These woody behemoths grow on dry, well-drained, mountain slopes and mesas, and are easily recognized by their tall, straight, thick trunks, clad in scaled, rusty-orange bark that has split into big plates. They are also easily identified by smell - Ponderosa Pine bark smells like vanilla or butterscotch.